Enough of that heavy stuff for now — time to take a look at one of the coolest things that you can do with text. Here's an easy way to create a text-shaped picture, one that's fully editable. 1. Using FileOOpen, Adobe Bridge, or by double-clicking an image file, open a photo in Photoshop. 2. If the Layers palette has a layer named Background, double-click the layer name and rename the layer (as shown in Figure 13-14). If the image has multiple layers, choose LayerOMerge Visible from the main menu. You want to work with a single regular (not background) layer for this project. Background layers do not support transparency, and no layers can be placed below a Background layer. Figure 13-14: Renaming a background layer converts it to a regular layer. 3. Add your type with the Horizontal Type tool. 4. Click the type layer in the Layers palette and drag it below the image layer. 5. In the Layers palette, Option-click (Mac) or Alt-click (Windows) on the line between the two layers. The two layers are joined together, as shown in Figure 13-15. When you clip two layers, the lower layer serves as a mask for the upper layer. The upper layer is visible only where the lower layer has pixels and adopts the opacity of those lower-layer pixels. 6. Finish the image with a layer style (applied to the lower layer) and any other artwork that the project requires. You can click the lower layer in the Layers palette and then click a favorite layer style in the Styles palette. Or, of course, you can create a custom layer style by choosing the LayerOLayer Style command. 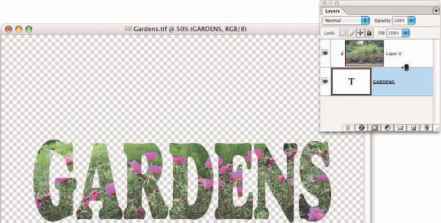 In Figure 13-16, you see a stroke, a bevel, and a slight outer glow applied to the GARDENS layer. Figure 13-15: "Clip" the upper layer to the lower layer.